Preface: Guitar Tricks is in my honest opinion the best online guitar lessons provider out there. They offer a huge collection of videos that I’m sure any guitarist will find useful no matter their skill level. If you want to try them out, you can signup for a FREE 14-day trial by using this link (full disclosure: I’ll get a small kickback if you signup with that link, which helps me keep Musician Tuts alive). Furthermore, if you decide you want to purchase a Guitar Tricks membership, use the coupon code Save20 for 20% off your purchase or 60OFF for 60% off your first month’s price. If you want to learn something new on guitar these days you have a few options. You can either watch free videos on YouTube, read tutorials and guides online, go see an in-person guitar instructor, learn from a book, or signup for a premium guitar lessons membership. There are pros and cons to each method. However, with premium services you often times get a much better user experience due to the fact that these services have more resources and are able to offer premium videos, tablatures, tools and more. That’s why today I’m going to be doing a complete review of the premium guitar lesson website – Guitar Tricks. In this Guitar Tricks review, you’ll learn everything you need to know about Guitar Tricks including what they offer, a peek into the course layout, and if it’s worth signing up. 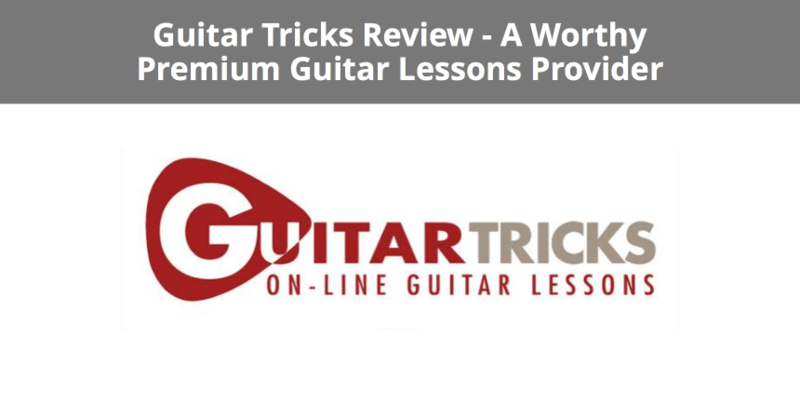 Guitar Tricks has certainly been around for a while so they know a thing or two about offering premium online guitar lessons. In the following sections, I’m going to dig into more details regarding what the course plan looks like, cool features of being a member, pricing information, and more. The course content that is available once you signup for a Guitar Tricks membership will take you months or even years to get through. Depending on your level of experience playing guitar, you may or may not benefit from watching all of the videos available. However, their collection of videos is so vast that no matter how much experience you have, you’ll likely find something new that you can learn. At a high level, the Guitar Trick course is broken up into two sections: beginner lessons and experienced lessons. Below, I’ll outline what both sections include. 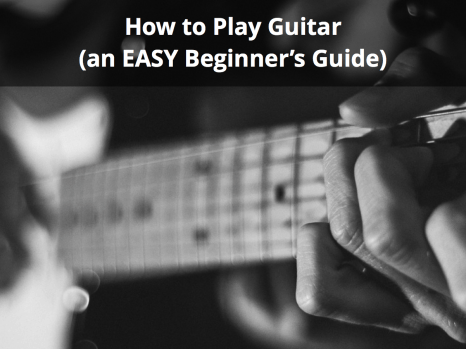 For beginners, Guitar Tricks offers a two-level series of lessons they call “guitar fundamentals”. These videos essentially go over everything you need to know about guitar to get started. 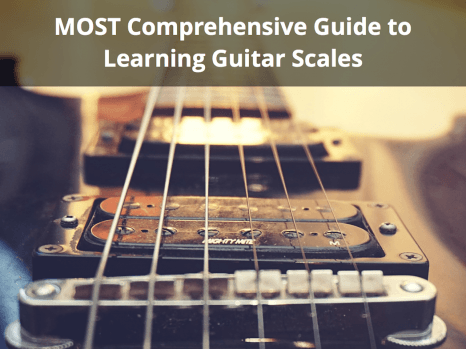 From learning how the guitar works to playing simple chords, all the way to getting an introduction on the major/minor scales and reading music. The following is an outline of each topic included in levels 1 and 2 of the Guitar Tricks Core Learning System for beginners. This was the outline provided at the time of writing this article. However, Guitar Tricks may update/modify these sections in the future. Chapter 2: Let’s Learn to Play! 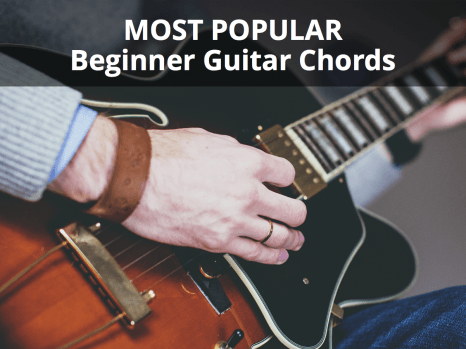 Chapter 4: What Is A Chord, Really? The image below shows the Guitar Tricks’ Core Learning System lifecycle that you’ll follow as a beginner guitarist. The second aspect of the Guitar Trick course overview is for the more experienced players. 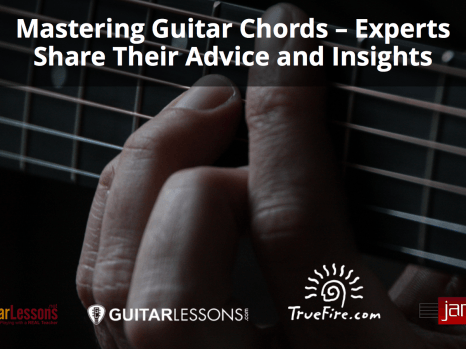 If you already have a few years experience under your belt and know your way around barre chords, major and minor scales, etc then it might make sense for you to jump directly into the experienced lessons. As mentioned above, the experienced lessons section branches off into three separate sub-sections depending upon which genre of music you want to learn. Each genre of music comes with two levels of lessons and below I’ve outlined the chapters included in each. Same as I’ve mentioned above, the outline for these sections was taken the day of writing this Guitar Tricks review post and may change in the future. Chapter 2: Electric Rhythm Tools – Vol 1. Chapter 3: Country Lead Tools – Vol 1. Chapter 4: Electric Rhythm Tools – Vol 2. Chapter 5: Country Lead Tools – Vol 2. Chapter 1: Picking Primer: CAGED System and More! Chapter 2: Lead Secrets Revealed! Chapter 3: More Rock Rhythm! As can be seen in the screenshot below, the sections highlighted in red are the components that correspond to the experienced lessons that I’ve just outlined. If you’ve ever found it difficult to learn a song or want to learn the exact intricacies of a song, Guitar Tricks’ song lessons videos are an amazing resource. First off, when you visit the song library page, you have a range of filtering options allowing you to sort by genre, popularity, instructors, difficulty, and more. 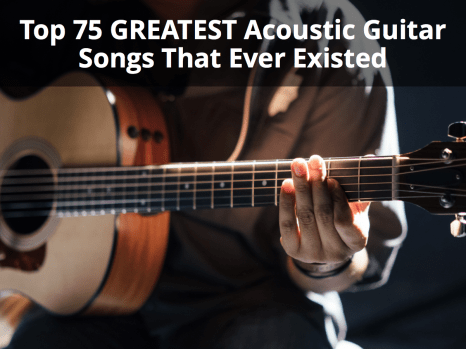 They currently hold a collection of over 700 songs so there’s surely something there for everyone. Apart from the vast collection of songs offered, the actual videos that explain how to learn and play the songs are incredibly in-depth. Although the format may vary slightly depending on the instructor and song, most lessons break down the song piece-by-piece allowing you to follow along easily. For example, the list below shows the outline of videos you’ll watch to learn the song Brown Sugar by The Rolling Stones from start to finish. 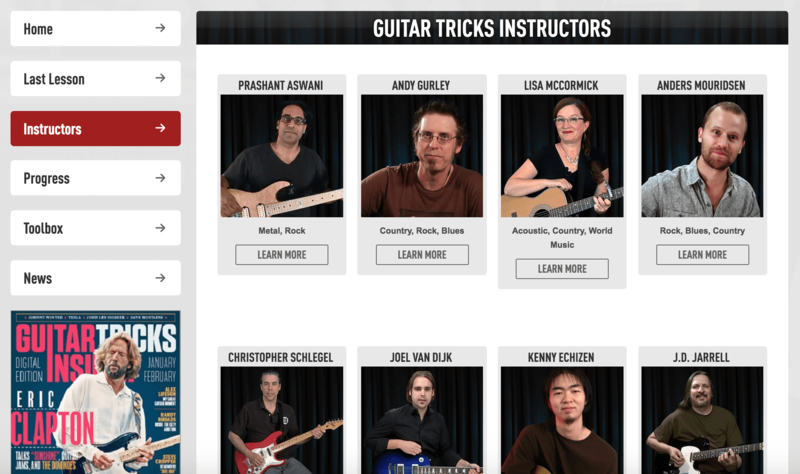 Guitar Tricks comes loaded with guitar lesson videos from a variety of instructors. Now, what’s cool about this is that if you find a guitar instructor you like, you can go to the instructor tab in the dashboard and click on that instructor’s profile. You will then get a complete list of lessons that that instructor uploaded. If you aren’t quite sure yet which instructor is going to be the best for you, you can always check out this section and then look at which genres each instructor specializes in. Go through a few of them and see who you like best. It should be noted however that not all instructors have the same material. So, a guitar lesson on topic X from a particular instructor may not be available from another instructor who specializes in the same genre. You can also ask specific instructors questions by heading over to the Guitar Tricks forum and searching for the instructor’s name. This is one feature I REALLY love about Guitar Tricks. They offer an artist study section that essentially breaks down certain habits of legendary guitarists to allow you to incorporate some of their tricks in your own playing. Certain artists have more video content than others, however, for the most part each artist study is pretty comprehensive. I myself am a huge fan of Jimmy Page and was excited to see that there was a Jimmy Page artist study that dove deeper into his playing style and broke down each part piece-by-piece to make it very easily digestible for the viewer. Within the Guitar Tricks dashboard, you have access to a handy progress page that keeps track of all the lessons you’ve completed or are in the process of viewing. This is a really easy way to keep track of where you are in the lesson program. It also provides you with the last watched lesson so that you can easily remember where you last left off. They’re all very helpful and each serves an important purpose. Personally, my favorite tool (and probably that of many others) is the jam station. It gives you the option to choose which genre of backing track you want to hear and then gives you a nice list of options to choose from. To give you a little preview of what the video layout/quality looks like with Guitar Tricks, I’ve provided a sample video below. This video is part of the artist study section and is geared specifically towards Eddie Van Halen’s playing style. Notice that there are multiple camera angles, the video quality is top notch and the instructor is very clear with explaining each section before he dives into it. Full Access Subscription – Provides access to all lessons available and unlimited use of the other features. When you signup to Guitar Trick you receive a 14-day free trial that allows you to take advantage of the full access subscription. Therefore you can view as many videos as you like and use all the features you want without restriction for 14 full days. This will allow you to explore the course, get a feel for the instructors, and become familiar with the overall look and feel of the Guitar Tricks member dashboard. Once the free trial period is up you can either choose to continue as a full access member and pay the subscription fee or cancel your billing and stick to being a basic member. If you choose to continue with Guitar Tricks, there are two billing options to choose from. be billed annually at $179 which provides you with a 25% discount. However, if you’re still in trial mode you can save even more money on an annual subscription by clicking on the coupon code button (the big red section in the screenshot below) to get an additional 20% off. Therefore the final annual price will come out to being $143.20 which is a really a great deal in my opinion. Alternatively, if you just want to try it out for a month but don’t want to pay the $19.95 use the coupon code 60OFF for 60% off your first month resulting in a first-month price of $7.98. Just be aware that if you decide you don’t want to continue using Guitar Tricks after your free trial is over, you need to cancel it manually. I always find it’s a good idea to set a reminder on your computer or phone calendar to remind you that 14 day period is almost up. In the event that you decide you don’t want to continue just navigate to Account > Billing > Manage then click (Cancel Billing) and either reach out to Guitar Tricks via email or phone support. That is just some precautionary information that you should be aware of. All-in-all I’m honestly very impressed with Guitar Tricks. I love the look and feel of the dashboard and was pretty impressed to see that they had cool features such as their artist study page. Overall, the quality of their videos are great and the teachers know what they’re talking about. There’s really not all that many bad things to say about Guitar Tricks. However, if I had to say something I would mention that the navigation can be a little confusing at first (especially the core fundamentals section) and that some of the videos can be a little slow to start (too much introductory content before you get to the meat and potatoes). Hopefully, this Guitar Tricks review has helped you decide on whether or not Guitar Tricks is the right premium guitar lessons service for you. Leave me a comment in the section below if you have any questions about Guitar Tricks or if you’ve tried the service yourself, I’d love to hear your thoughts. Overall, I found Guitar Tricks to be a great choice for both beginner and experienced guitar players to easily learn new techniques, musical genres, songs, and so on. Although the navigation can be a bit confusing at first and there is sometimes a bit too much "fluff" content in the videos, ultimately there are plenty of great lessons that I believe will help advanced any guitarists' playing ability.